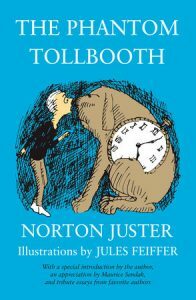 Read-Alikes for The Phantom Tollbooth by Norton Juster. Adler, C. S. Help, Pink Pig! Avi. The Book Without Words. Babbitt, Natalie. The Search for Delicious. Baum, L. Frank. Oz series. Christian, Peggy. The Bookstore Mouse. Coville, Bruce. Aliens Stole My Body. Edwards, Julie Andrews. The Last of the Really Great Whangdoodles. Enzensberger, Hans. The Number Devil: a Mathematical Adventure. Fforde, Jasper. Lost in a Good Book. Greer, Gery and Bob Ruddick. Max and Me and the Wild West. Juster, Norton. Alberic the Wise and Other Journeys. Linaweaver, Brad. The Land Beyond Summer. McKinley, Robin. The Blue Sword. Pullman, Philip. The Scarecrow and His Servant. Rupp, Rebecca. Journey to the Blue Moon. VandeVelde, Vivian. A Well-Timed Enchantment. Woodruff, Elvira. The Disappearing Bike Shop.